Addis Ababa, February 11th, 2019: African Heads of State and Government today joined chorus of calls for digital transformation of the continent in the Ethiopian Capital, Addis Ababa. 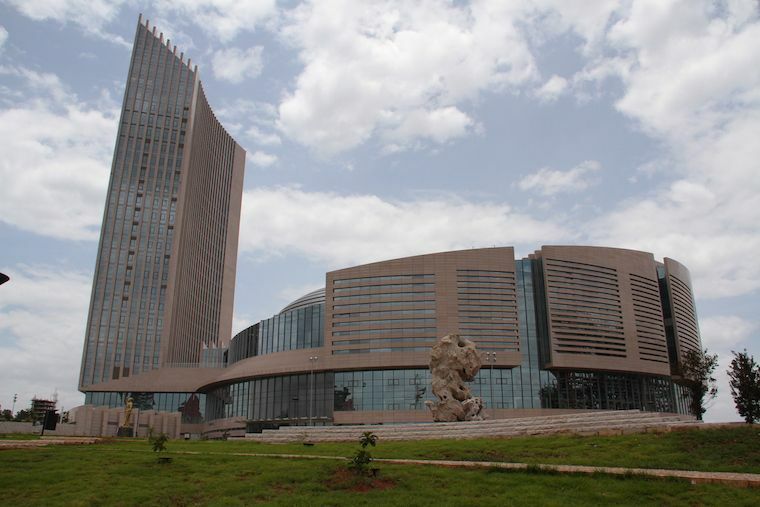 The call was made at the African Union headquarters on the margins of the 32nd African Union Assembly of Heads of State and Government during a high level luncheon dubbed “Digital Transformation for Africa: leaping into the African Century” centered on the issue of the continent’s digital transformation, which aspires to alter the way both the public and the private sector operate. The Chairperson of Africa’s Premier Institution – the African Union Commission, H.E. Mr. Moussa Faki Mahamat speaking of Digital Transformation, stressed that Africa could effectively address the development challenges of education, health, agriculture as the continent cannot afford to miss the digital revolution. “Digital Transformation should be positioned among the top priorities of African Union Agenda 2063. As it connects all sectors, it requires a more transversal than vertical approach as well as more intense intersectoral coordination that will make it possible to achieve the objectives of Agenda 2063,” the Chairperson said. Hosting the introductory address, African Union Commissioner for Infrastructure and Energy, H.E. Dr. Amani Abou-Zeid also cited a need for leadership and a vision to push the frontiers of digitalization and innovation for Africa to take its rightful place in the 21st century. “To foster the enabling environment and to harness the full benefits of digital transformation, we need to develop a digital strategy and action plan that will serve as a blue-print to transform all sectors of the economy,” the Commissioner urged. The African Union Commission Chairperson’s proposal was echoed in remarks by other leaders at the high level meeting. The President of the Republic of Rwanda and outgoing Chair of the African Union, H.E. Mr. Paul Kagame has backed the on-going efforts by the AU to further accelerate the adoption of digital identities, saying this would shore up citizen inclusion in the global economy. “We will continue to advance on the digital transformation agenda championed by the African Union, Smart Africa, the Broadband Commission, as well as the many external partners here with us supporting these efforts,” President Kagame added. At the meeting, President Kagame recognised the presence of Estonian President H.E. Mrs. Kersti Kaljulaid, saying there was a clear willingness by Estonia to collaborate productively with the continent, especially in digitalisation. On her part, President Kaljulaid explained to the high level gathering that her Baltic nation of 1.3 million people is one of the world’s most digitised nations, and the people enjoy an almost paper-free relationship with the state that allows them to do everything online - from voting to filing court claims to receiving prescriptions. “In ten years, my dream for Africa is to use the e-prescription given to me in Estonia and pick up the medicine anywhere in Africa supported by my Digital Identity,” President Kaljulaid closed her intervention. As more countries shift their services online, Estonia's experiment offers a glimpse of how interacting with the state might be for future generations. The remarks by the leaders appeared to represent a coordinated effort to push forward the digital transformation for Africa through the development of vision, policies and measures for Pan-African digital integration. Later in deliberations by high level panelists one of the top issued raised was cooperation across domains and across borders to realize the full social and economic potential of digital technologies, mitigating the risks they pose, and curtailing any unintended consequences. The Vice President for Africa at the World Bank, Dr. Hafez Ghanem said there is huge potential for digital impact in Africa. But to achieve that, the five foundations of a digital economy need to be in place including digital infrastructure, literacy and skills, financial services, platforms, and digital entrepreneurship and innovation. “We, at the World Bank, are committed to helping Africa build its Digital Economy, and to this end the Bank has awarded US$ 25 billion for digitalization of the continent,” the Vice President announced. On her part, the Executive Secretary of the UN Economic Commission for Africa (ECA), Dr. Vera Songwe reflected on multiple issues including Continental Free Trade Area (AfCFTA), digital identity, investment opportunities and strengthened partnerships. Dr. Songwe noted that 542 million Africans, currently live without digital identities and about 75% of Africans have a mobile, but less than 50% have a Digital Identity. 'We need to ensure that every African who has a mobile phone has a digital Identity. This will deliver economic productivity and prosperity for Africa. All we have to ensure is that our governance and policies work well," Dr. Songwe said. Also addressing the leaders, the president of the European Investment Bank (EIB), Mr. Werner Hoyer reported that the close cooperation between the European Investment Bank, the EU Bank, and African partners enabled record activity last year with €3.3 billon of EIB new investment that will benefit projects across the continent. “The EIB is strengthening its cooperation with African and international partners to support digital transformation and the reduction of the gender digital divide across the continent, and discussions with African leaders would help to strengthen the impact of the bank’s investments across the continent in the years ahead,” Mr. Werner indicated. The United Nations High level Panel on Digital Cooperation, Mr. Jovan Kurbalija, Executive Director of the Panel’s Secretariat, said the point where technology meets humanity, leaders need to make bold decisions with long term impact. “The United Nations High level Panel on Digital Cooperation aims to connect the dots amongst different silos and make global Digital Policy generally inclusive,” Mr. Kurbalija asserted. The panelists’ remarks sparked lively private discussions amongst leaders but what was not in debate, however, is that the starting point for digital transformation is leadership. They agreed to act quickly to move the continent into the 21st century. “The continent now has this great opportunity, to leap into the African Century by embracing the digital era,” opined Commissioner Abou-Zeid in an earlier address. The high level event was organized by the African Union Commission in collaboration with the Government of Estonia and the World Bank. It brought together African Heads of States, the President of the Government of Estonia, high officials from the Government of Germany, Senior Executives from the European Union, United Nations, World Bank, African Development Bank, European Investment Bank, Regional Economic Communities and private sector. Migration and Displacement in Africa is the new focus of African leaders at the 32nd African Union Summit. The AU Assembly, which was held on 10 and 11 February 2019, was preceded by meetings of the Permanent Representatives Committee on 22 and 23 January 2019, as well as the meeting of the Executive Council on 7 and 8 February 2019.